Here's a little Valentine idea for couples. 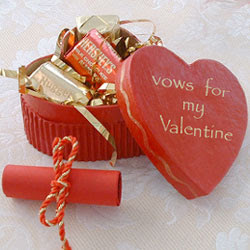 Give a gift that states, or re-states your commitment to your spouse or significant other. If you're married, make a copy of your wedding vows on colored or patterned paper, roll it like a scroll and fasten with a ribbon. If you're dating, write something appropriate for the stage of relationship you're in - like "I will be here as your support and cheerleader! I love you!" Tuck it in a gift box with his or her favorite chocolates.